Virtual learning offers broader experiences and more interaction for students and faculty. From guest lectures to distance learning and everything in between, virtual learning is ushering in a new wave of possibilities in education. Virtual learning moves us away from the static classroom – professors at the front, speaking from podiums and students in the back, taking diligent notes – and allows students to more fully interact, collaborate and engage with faculty and their peers. Students are no longer limited by their physical campus, and now have the opportunity to immerse themselves in cultures, languages and experiences, sometimes from halfway across the globe. The third annual CDW-G 21st-Century Campus Report, detailed in my September column, found that virtual learning, which delivers education to students regardless of where the professor or other students are located, is becoming much more common on higher education campuses. Of the institutions surveyed, 61 percent offer virtual learning, while over half of students surveyed said they have taken a class that offered virtual learning. One organization on the forefront of virtual learning is the National Institute for Technology in Liberal Education (NITLE), offering a high definition (HD) solution to its membership, which is made up of small, liberal arts colleges. These institutions thrive on their small size and specialized instruction – providing a depth of knowledge and personalized instruction that many students look for and need to succeed. Small institutions, however, may not always have the breadth of faculty experts and course offerings that larger institutions do. 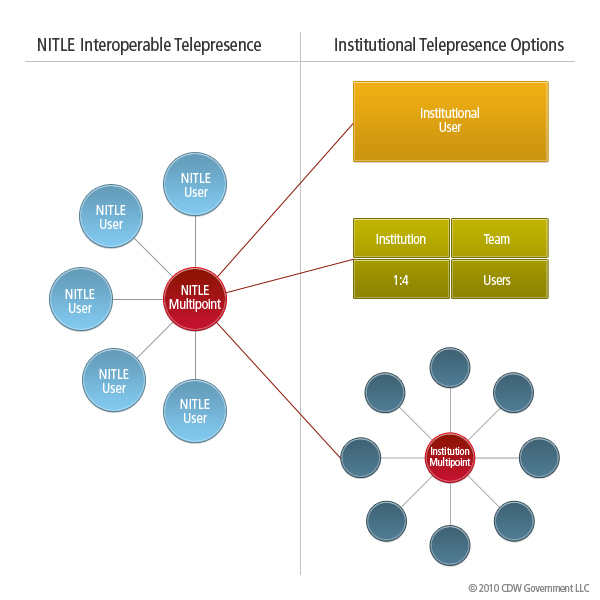 NITLE’s virtual learning solution fills this gap by connecting members, facilitating professional development and providing broader access to academic resources in a cost-efficient way. The Consortium for Innovative Environments in Learning (CIEL) is a NITLE member taking advantage of the virtual learning solution to deliver immersive, interactive foreign language classes and language learning resources to students and faculty in its Virtual Language Learning Project (VLLP). The project launches in spring 2011 with a Swahili virtual language class. The Swahili class will be a point-to-point structured class, with the professor leading instruction from a remote location in Kenya. Point-to-point structure connects faculty to one or two students via NITLE video collaboration, allowing for specialized instruction. NITLE’s hosted directory service, similar to an e-mail address book, allows students and faculty to add each other to their personalized address books and access each other instantly via the video bridge. Through virtual learning, CIEL seeks to extend learning from a global perspective by providing students with face-to-face multicultural interactions that will enrich their second language skills. CIEL’s long-term goal is to implement virtual learning in other curricula outside of foreign language to its 13 member colleges. As administrators and educators evaluate plans for virtual learning initiatives this year and next, the solution offers a cost-effective option that can enable students to experience new languages and cultures, without the costly expenses of a study abroad program. HD solutions, such as the ones used by CIEL and NITLE, offer highly immersive, effective and engaging learning environments, and enable real-time discussion and collaboration. For institutions looking to add courses or include hard-to-find experts in its current curriculum, taking a page from organizations like CIEL can help determine which solution may work for them. Budgetary constraints are ever-present and CIEL was not immune to those challenges when identifying funds to support the solution. Antilla suggests looking to Federal grants for support with those challenges. In addition, institutions should provide faculty with the professional development needed to use virtual learning successfully in the classroom. Ensuring that faculty members receive proper training on new equipment, and providing on-site support if needed, will help ensure maximum return on investment. Virtual learning affords colleges and universities the ability to give students more of what they want – expert faculty and lecturers and engaging lessons. Now more than ever, institutions should consider virtual learning to seamlessly open doors and new worlds to students.